In theory: the Honda XL1000V Varadero is a great idea; take the funky Firestorm motor and put it inside an adventure touring chassis. But the result didn’t live up to that and the Honda XL1000V Varadero hasn’t matched the success of the BMW R1150GS. Whileit has bags of comfort, luggage capacity and grunt, its thirsty engine, top heavy handling and plain Jane looks haven’t helped it win friends. The Honda XL1000V Varadero's chassis isn’t bad, but the soft front forks let the Varadero down, diving under hard braking. Some owners, especially bigger blokes, fit stiffer springs and heavier fork oil. The soft-ish, very comfortable suspension does keep two people, plus luggage, thrumming happily along all day however. The Firestorm motor of the Honda XL1000V Varadero is very tough, makes lots of lowdown poke and feels relaxed at motorway speeds. Apart from its heavy thirst for unleaded it’s hard to fault and generally lasts 50K miles before showing signs of serious wear. 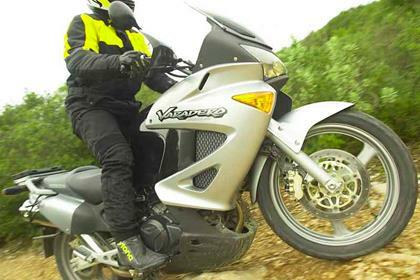 The facelifted 2003-onwards Varaderos feature fuel injection and a sixth overdrive gear, which makes the motor that bit more suitable for the job of long distance biking. 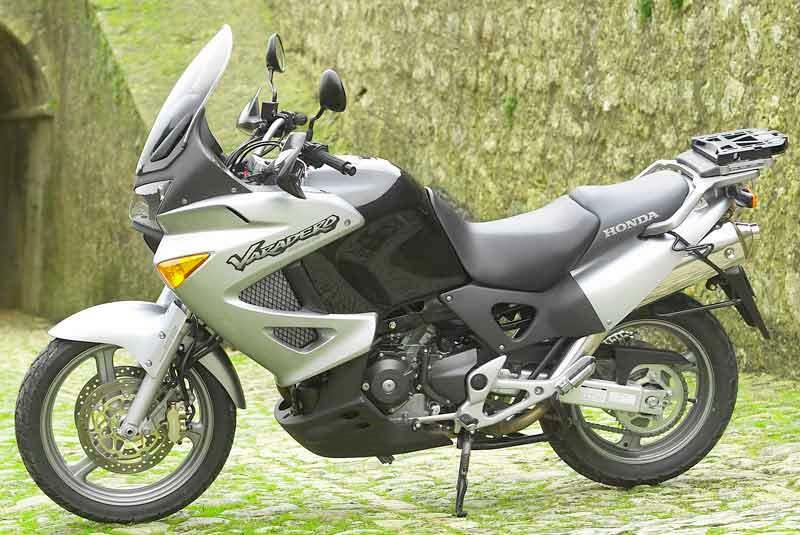 Build quality of the Honda XL1000V Varadero is generally very good. The only weak areas appear to be the exhaust system, which rusts quite easily and a dodgy sidestand cut-out switch – which was fixed via a factory recall. Owners tend to look after them, so with a service history and soft resale values, the Varadero makes a good used buy. The Honda XL1000V Varadero is slightly cheaper than the BMW R1150GS/R1200GS, but loses its resale value a little bit quicker. On the upside, it seems more popular than something like an Aprilia Caponord…but then so are Keith Harris and Orville. Like most adventure touring bikes, the Varadero needs hard luggage, heated grips and other accessories to do the full 3000 mile touring gig. Find a Honda XL1000 Varadero for sale. 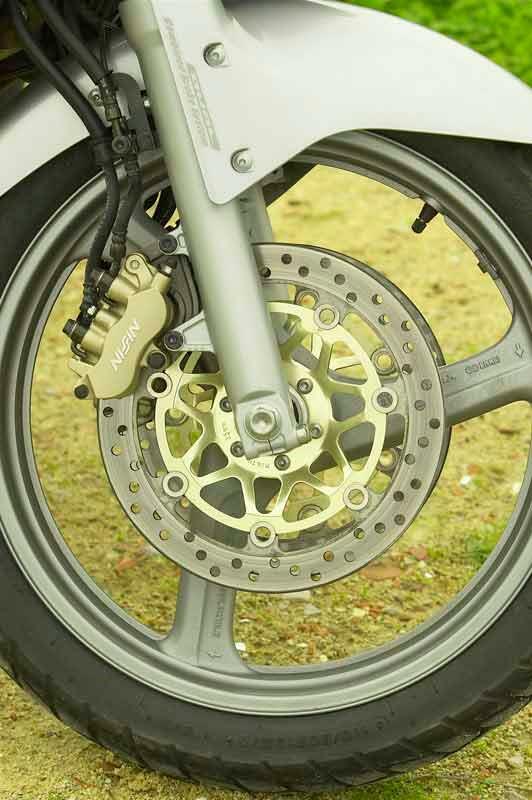 The Honda XL1000V Varadero comes with the Combined Braking System which links both front and rear discs, splitting the braking force between them. Some like it, some don’t. The XL1000 also features a decently tall fairing screen, generous exhaust heat shields for the passenger’s legs, plus handguards. 1999: Honda XL1000 Varadero launched. 2003: Updated version launched; new bodywork panels, headlights, screen, extra 6th gear in engine, bigger fuel tank and fuel injection replaces carbs. 2005: ABS becomes standard equipment. 2006: £1000 cut off RRP. 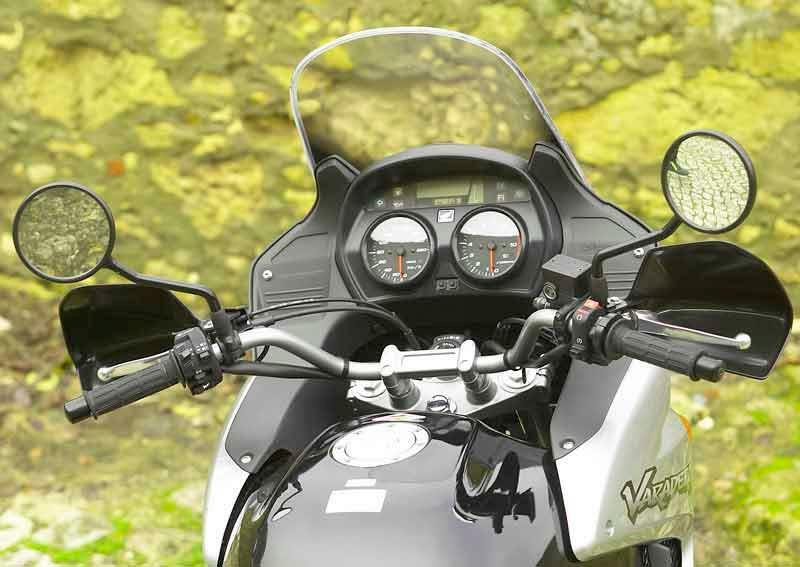 2004 onwards: Varadero XL1000 ABS. Same bike but with ABS anti-lock brakes. Became standard model in UK from 2005 on. 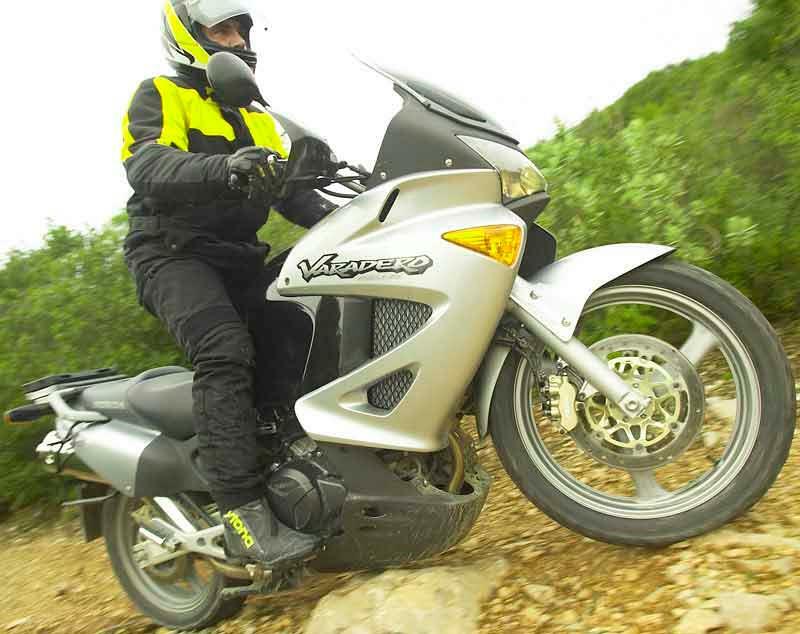 40 owners have reviewed their HONDA XL1000V VARADERO (2001-2010) and rated it in a number of areas. Read what they have to say and what they like and dislike about the bike below. Victor the varadero has gone. I've just traded my Varadero in but it will be missed. When I bought this bike they were called giant trailies and were not even on most people's radar. A great bike, yes it's a bit heavy and top heavy at that but you soon get used to it. I would not call the suspension soggy, I think squishy is more appropriate. But squishy is comfy. I did service the forks but didn't feel it necessary to but in heavier fork oil or up rated springs and I'm quite a large 15 stone bloke. I did, however, replace the rear shock with a hagon which improved the rear end especially with luggage. Very progressive, a little vibey under 2500rpm, and just above 6000 seemed to really pick up and take off. Most day to day riding tho was spent trundling around in between these two marks in the plentiful mid range. Only one reliability issue during 11 years and 35000 miles (cdi/igniter box) It was very reliable. Other bikes came and went during my ownership but this one always stayed. My bike had had 5 previous owners when I bought it so none of them had kept it very long, and going by its condition none of them had looked after it that well either. I think it is testament to Honda build quality that it looks no different now than it did when I bought it other than a little extra rust on the exhaust mid section, and I didn't exactly pamper it. It got used year round and even did 2 elephant rallies as well as European touring and general use. If you were heavy handed fuel consumption would drop through the floor, 26 mpg was my worst, but cruise along the autobahn at 75-80 and it was capable of mid forties. I fitted a touring scottoiler...what a great piece of kit, kept chain adjustment to an absolute minimum. if you don't have one of these on a chain driven touring bike get one. Full givi luggage, crash bars (which saved the fairing on more than one occasion) and a touring screen and heated grips got fitted too, all well worthwhile. I liked this bike so much it has been a tough decision as to wether I keep it or trade it in. The Churchill of bikes: a fat, heavy drinker - but a Great nonetheless. Put it this way: at 13 years old and with 20k on the clock, the Varadero was still desirable enough to be stolen from right outside my house. I still have both the keys so Burglar Bill must have been able to lift up the 270kg behemoth. Bought the bike somewhat by accident - I'd gone out with a mind to buy a Deauville: something soft and practical. I certainly did not regret the decision. In some ways what are described as faults with the Varadero - the linear (some would say "flat") power delivery, the top-heavy nature, the fact that it looks like the north end of a pig going south - are advantages in disguise. The linear power delivery means that- whether you're coming out of a tight corner, or pulling out of the entrance slip road to a motorway, or just riding in the greasy rain of a late summer's day - you can just hammer it and the bike will deliver without sending you sideways into a wall. Regarding the top heaviness: it actually means that turn-in is made easier because the bike will react easily to movements. This is particularly useful in heavy traffic/filtering, where quick left-right-left at low speeds and high lean are made easier by the pendulum-like nature of the bike. This manoeuvrability is of course aided by the arm-chair like comfort and wide handlebars. The ugliness means that, at least until it was stolen, it was largely ignored by passers-by. This is not a poser bike, and unlike my past bikes - the Dragstar 125, my Fazer FZS 600, and my 2002 Triumph Thunderbird - the Varadero was never once pushed over in the street or in the car park; expensive tragedies that befell all the pretty bikes I had previously. With the tall windscreen, crashbars, touring panniers and top box it really is the most practical bike you can get for the money: all day touring with great weather protection (no need to wear a scarf of balaclava in winter), no costs if you inevitably drop it (see above about top-heaviness), and the top box and panniers mean you can go to the supermarket and fit a week's shopping in it. All excellent. The one downside - and it is an expensive one - is that around town it really would only do 6 miles to the litre, which is HumVee territory. Very nearly a deal breaker if it weren't for the fact that this do-everything bike is quite incomparable to any other machine. So in short: it will do fun, it will do practical, and it will do heavy drinking. My old FZS 600 had 95 horses, and above about 7k revs you suddenly went light-speed. Accordingly, it actually felt like it had the beans. The Varadero is completely flat up the power curve, which is good or bad depending on your perspective. 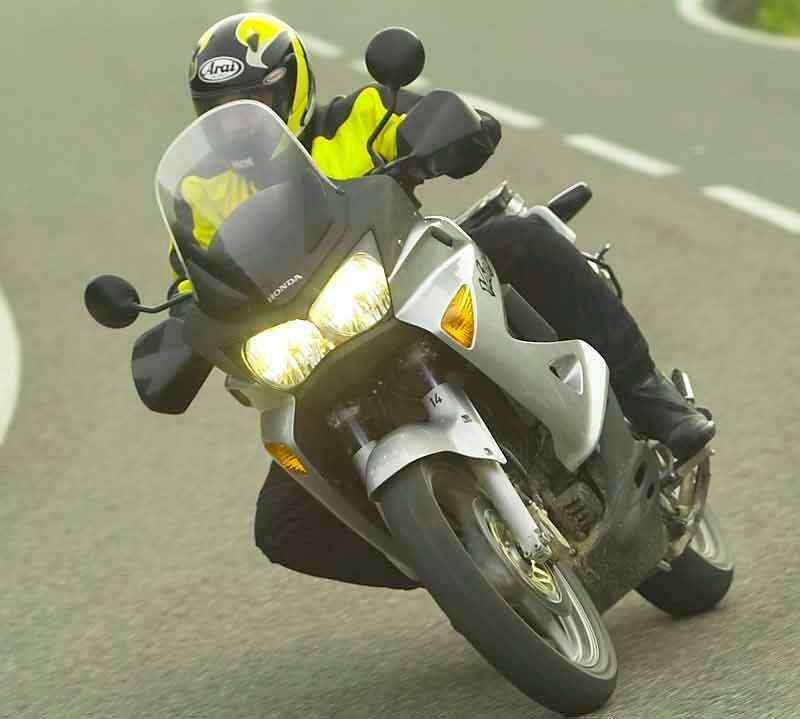 Great with a pillion though - the torque means that even your most obese passenger makes no difference to the get-go. Bulletproof, and with the crashbars, pretty hard to damage either. Solid construction, apparently not solid enough to stop it getting nicked, though. Service intervals about 4000 miles - not too bad. Goes through tires at a rate of knots though because of the weight. Drinks petrol as if it has a partnership with the Sheikhs. No fuel gauge. Seriously. WW1 planes had fuel gauges, and in 2002 Honda thought it more important to have an engine thermometer. Unacceptable in a vehicle where it really pays to know how much jungle juice you have left. My second Vara. I bought the first one in 2003, and swapped for a new one in 2010. It's probably time to get a different bike now though as I've stopped touring and am too old to manage the top heaviness of this bike. I've loved both and put some good miles on the first one, but not so many on the new one. They are hugely under-rated, even though one was raced in the Manx Grand Prix (didn't win). Only problem I've had was full luggage and two grown fellas on board. Braking was not up to scratch - my fault for not anticipating! They are top heavy, especially with a full top box, panniers and six foot plus passenger. Should have had heated grips. Well, I'm very partial in my review but I love this bike. Had it since 1999, 0 km. Been around Greece and Europe and never put a foot wrong. Changed the shoggy suspention with ohlins front and rear and can move to the rythm of much-much faster bikes in the Dolomiti Passes we visit every other year. Impecable brakes, outstanding built quality, great miles-eating ability. In these past fourteen years the only things that needed attention were the fuel pump and the alternator, the two weak points of the bike, they were changed not because they failled but for my peace of mind. Oh yes, and one of the two taillight lamps. I have been motorcycling for over 30 years and have experienced the whole range of bikes over that period. I bought a Varadero new in 2009 and without doubt it is the most USEFULL bike I have ever owned. I have been all over Europe on it (mainly with my good lady). Its not a sports bike, its not on off road bike, its not commuter. What it is is 80% of all of them - and in the REAL WORLD that adds up to a really great bike. It will cruise all day 2-up with luggage in comfort at 100mph, it will struggle up snow covered roads in the Pyrenees, it will scramble up tracks over looking the Cote-D'Azur. It has never missed a beat and had nothing other than normal servicing. Don't be fooled by some old 10yr old review by someone who rode one for a day or 2, these are great bikes. Never ever saw myself on a bike such as this but after excepting invite to go touring round Spain with the GS boys needed something more suited than my Superduke. Mine's 2003 first of FI ones, fitted with full luggage, Hagon suspension and high screen. What amazed me is the ride and handling of such a big bike. Its very heavy which you feel setting off (and in danger of toppling you) but once fast enough to lift your feet, it just disappears. Acceleration although not quick is smooth. The ride and handling is excellent for such a large bike, but you can tell the uprated suspension does a lot for this. Comfort is ok, the seat if anything probably too soft and will be better to a lighter chap. Build quality on mine good but did see a few shockers when looking around. Its not the typical wash and go Honda but shown a little care does keep its shine. Screen although larger than standard whistled around my head but after reading about tap washers on a review on here did some alterations to move the screen forward. Revelation, makes touring distance so much easier. Will try if similar problems on future bikes. Luggage is Kappa not Honda stuff. Robust and waterproof, however panniers do stick out a long way preventing some filtering and wind drag makes bike sluggish above 85. Now for touring leave them at home and use tankbag, top box and strap roll bag to back seat. Fuel wise everyone keeps telling me how poor they are. Complete rubbish, generally get 45mpg and with such a large tank can get nearly 250 miles. I'm converted, it's a really underrated bike, if it was much lighter and more powerful it would be fantastic. I'm looking at the next generation of adventure bikes but for the world of me can't see them worth 4 times my Varadero. to only achieve 35 mpg would indicate that you either need a sports bike or anger management counselling. If, like me, 900 miles in 36 hours floats your boat - get Vara. Wonderful V-twin, great view of the action. I admit that a new custom seat from Melvin in Coventry really transformed the comfort. What a Bike! this listing is way out of date, the 2001-2003 differences make it an almost different bike. the 2007 update was only cosmetic. the Fi varadero is NOT thirsty, MCN keep rolling out that old cliche, it is right up there with the GS, V-strom, guzzi etc. ive done an 850mi tour of the lakes and dales and averaged 54mpg and i wasnt hanging around. talking to other owners its also a lot more reliable than a GS too, buy a GS and expect at least 2 warranty issues. one guy i know is on his fourth final drive in 4 years, ive had to replace a tail bulb and an exhaust seal in 5 years, and i take mine offroading on salisbury plain. its also a lot more comfortable, too comfy to be honest, the seat could do with a bit less padding to make it narrower for standing up offroad. the only thing that i would say to prospective buyers to think about is the weight, if you can cope then its a great bike. Having owned 4 Blackbirds I decided it was time for a change so I brought a Vara.Well going from a smooth 4 cylinder onto a twin was a big difference and a surprise.I then went over to the TT on it and by the time I got back home I decided it at to go and I traded it in for my 5th BB.It felt brilliant once again to have all that power and a silky smooth engine. Life felt great.Anyway 18months later I rode up to the HU meeting in Ripley at a very conservative speed making sure that I did not get nicked had a great week end. Listened to the tales of adventures carried out on all sorts of bikes many of them being small ones and then again rode home very steadly.Anyway after that every time I went out on the bike I rode it at a very steady speed and quite honestly felt a bit of an idiot in doing so,so I thought that it was time again for a change of bike.So guess what I brought yes another Vara.Why ! Because it was a lot of bike for the price.It has the reliability and quality of a Honda and in comparison to the market lead a GS1200 its great value.I love the riding position and comfort and even though some say its a bit wallowly on the bends I am no knee down merchant so its not a problem.Just recently I met up with 2 friends who ride 1400 Kwackers and the Vara parked next to them did look a bit of a wimp but do you know what when we rode off and they quickly disappeared into the horizon after initially wishing I was up there with them I suddenly realised that I was enjoying the ride at my speed so that must say something surely.Oh yes and I did not have that awful feeling of getting caught doing a ridiculous speed.If your thinking of getting an Adventure Bike with limited funds then give a Vara a try because you really will be surprised at how good it is. I owned a Varadero on a T plate for two and a half years. A very good bike but its top heavy. Once you put the three cases on it it becomes dangerously top heavy. On a recent tour to Devon I lost it twice at very very low speeds because it's centre of gravity wad far too high. I bought my '99 Varadero about a year ago, after searching for something easy and comfortable to ride. After years on sports bikes and sports tourers, it was the last throw of the dice before I gave up riding on the road altogether. And thank God I bought it! Even for an 11 year old bike, it runs brilliantly, is extremely comfortable, and even for a shortie like me (5'8") is so easy to ride. OK, pushing the bike around isn't easy, and it is pretty top heavy, but once moving it's a doddle. As with most Honda's, build quality is excellent, and it certainly doesn't look 11 years old. I've since fitted a top box and panniers, and Arrow cans (I couldn't help myself!). The only faults with the bike are it needs a 6th gear (which the bike got in 03) and the back shock is very soggy, but thats probably old age! Next on the list is a Hagon. All in all, can't fault the old girl, and when she goes a newer Varadero will probably be sitting in the garage. As some say, they are not the best toy in the box on most counts. But I can't find any faults with mine,gives me what I need and is one of the most comfortable bikes I've had. Better buy than a GS. By a long way. Overall. Works perfectly every time. More than adequate for my needs. R&H. Ok it's a bit like a pogo stick if you get enthusiastic. But a very useful engine and it almost even sounds ok. Handling maybe not GS levels but ride is certainly better. But 200 miles to a tank - easy. Long distance 2 up, easy. Equip. ABs - check. Cubby hole box on fairing - cheack. Easy to use top box - check. Fuel consumption meter - check. Fuel gauge. Errrrrr. Needs one. Adjustable screen - check. Spave under seat -check. Q&R. Honda quality and reliability at its best. Washed it for the first time in a year(full winter use) and it looks straight out of the showroom. Absolutely miles beyond any of the 3 BMW's I've owned. No faults or anything needed beyond servicing & tyres in 2 years of ownership. (interesting comparison to my GS problems - gearboxes, clutches, engines, batteries, electrics, luggage, cold starts, ignition etc) Value. Picked mine up zero miles but dealer registered for about 6.5k I think. Can;t think of anything better. Engine. Perfect for my commuting. Tried a GTR1400 last week but for my use the Vara is better. Lots of low down 2nd & 3rd stomp compared to the GTR, which seemed strangled at low revs. Not happy with the OE tyres though. Easy for somebody 5ft8 too. Well the Bike is beginning to impress a lot more. Handles far better without the luggage, I am going to refit the standard screen for better visibility. The fuel consumption hasnt dropped below 45mpg. The Metzeler Tourance tyres really impress !! I ride 600+miles a week on this beast and for two years it has never let me down once. It's quick, has bags of torque and is comfy. A negative for me is the weight of thing. I get 240-250 miles to a tank.  The review above is not really fair to a top notch bike. What can I say about the Honda XL1000? It's a big heavy tank, the seat is to high, it runs out of puff at 100, it so ugly it makes babies cry BUT what a bike. 200 plus miles on a tank, comfy mile munching, peg scraping fun even fully loaded (knocking on for 300kg before I climb on). Crash bars are a must especially if you go off road. Love it to bits. If your thinking of buying one, stop thinking and just do it. Like the writer of the last review this my first V twin and so I am finding it different.Having owned 4 Blackbirds over the last few years and loved everyone of them because I was riding it ensuring I did not get nicked for speeding ie far too slowly I thought it was time for a change. I had tried a GS1200 before I brought my last BB and of cause it felt far far different to the BB and because of the price I decided to buy another BB. I would like to try another GS some time now the BB is out of my system. Anyhow spotting a demo Vara in the dealership I arranged to take it up the ride for a test ride.I was not expecting a lot to be honest but within 2 miles I realised that I really really liked it and I did the deal.I have yet to have the first service so that is how few miles I have done.Having been out on it a few times now the niggles I have found are no fuel gauge and I live in fear of running out of fuel so I top up every time I go out and the seat is still feeling hard but I intend to get that adapted. What is a real revelation to me though and something that I wanted, even though some say the BB is comfortable, is the riding position. I can sit back enjoy the road and my field of vision is now brilliant.The engine is something I am getting use to and there have been a few times when I have dropped down a cog more than I needed to and it certainly, as you would expect feels different to the BB.The BB engine is so silky smooth and powerful and I do miss it but out of the two Rider Comfort or Engine I am at the age when I have to opt for the latter. All in all I am pleased with the bike and I cannot wait to get over to France on it soon.What I cannot work out though is given the sales of Gses is why Honda have never fitted this bike with shaft drive because I am sure if they did given Honda quality it would steal some of BMs market. First long term relationship with a V-twin after years of across the frame fours so have a slight tendancy to rev the T*Ts off the old girl.I bought the Vara as 3k cheaper than the nearest GS1200 and apart from the 50kg extra weight is a right larff to ride.Its so tall you really can see far enough down the road although when going through traffic you are very conscious of the width and a topbox plus tankbag is my prefered combi without the panniers for day to day commuting.Tank range I would say varies with laries - 180 miles to 260 miles take your choice ! Heated grips - first bike with and what a luxury! but still suffers from cold hands even with hand guards,Tall Givi screen absolutly necessary for commuting , although I prefer the standard screen if cracking on a bit down an unfamiliar road.. Front end dive on the brakes .. YEEE Haaaarr ! forks will be sent to Maxton in due course ,probably after about 10k, Brakes mmm ok ish..not like my CBR's Radials but the forks, tyres and weight may play a huge part in that!First time with ABS as well - got to say it has a certain entertainment value when scudding into A1 roundabouts. I was surprised with how sensitive mine was to tyre pressures and I could tell that mine was at a lower pressure than normal,What I would say about comfort is that my 93 ZZR1100 is more comfortable!and the backside hurts after about 50 miles - must still need breaking in! all in all a good commuter and road bike,can corner but needs picking up otherwise the footrests continue to scrape for a couple of years after. Would like to try a GS after getting used to the lumps and uglyness but in no rush..but would like the hernia's to subside after putting this beast on honda's easy to fit centre stand. The only thought now is is when to chop in for a new bike when this hits 20k - 30k or do I keep it going for 60k or so? Summary - if you're less than 5' 6" tall and weigh less than an average Sumo wrestler then buy something more suitable..I'm 17 stone and 6 foot and it can be a handful ,especially when you have had 2 cans, up a ladder and then the ladder and you slip down 15ft, knocks the Vara over trapping both your legs underneath...but thats another story! Great bike. Last of 06 on an 07! 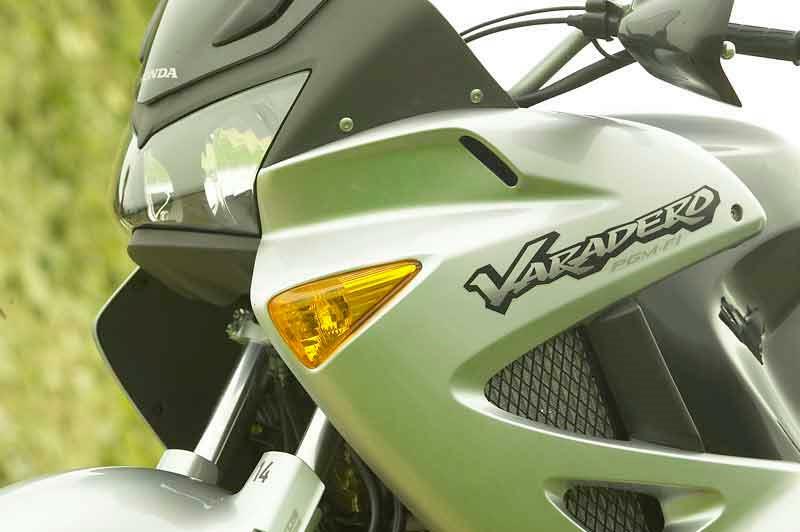 Swopped to Vara from years on sports bikes excellent performance & hanlding, excellent comfort, good tourer. Strengths: Comfort. Weaknesses: Weight. How to fault a perfect bike???? errrr the name is pants! I've had mine for 5 years now.... and it's been thrashed, abused, neglected and never once has the beasty let me down. +55k miles and a couple of modifications (drop 2 teeth on rear spocket, doctored cans with 51mm holesaw etc.) have left me wondering just why I'm looking at the newest and bestest bikes that the advertising industry can throw a me, with utter distain..... quite simply I don't need another bike, the one I have is the dogs danglers! Strengths: Town or country the bike delivers the goods. Weaknesses: Pants mpg when the 'ikkle voices' start talking to you. Owned one for over 2yrs now from new and although a few parts have been replaced under warranty, it has never let me down. In Guernsey the mpg is awful, but when I took it off the island, what a difference! Getting in access of 250mls to the tank and thats 70mph + everywhere. I have nearly always had this style of bike as it's the best all round comfort and control etc. Strengths: Easy of use, comfort, presence and that stonking engine. Weaknesses: Weight (245kgs) dry 04 onwards and fuel economy in urban areas. Aprilia Caponord will be my next one as it has all the Varadero has but its 30kgs lighter with a taughter chassis!! After riding sports tourers, this bike has been a revalation. I can still walk after a run to Scotland! Carries as much (or as little) luggage as you want, pillion too, no bother... Strengths: Comfort, ability to see the views, good, strong motor, fun, not likely to lose license!! Weaknesses: Front end a little soft, brakes could be sharper, no mainstand as standard. Good touring and pillion bike that can embarrass 600cc+ sports riders. Original screen too low for tall riders. Only downside dreadful economy, on a recent tour to Scotland, I was hitting low 30's mpg, with a 25 litre tank the fuel light was coming on at 140 miles - not good for a tourer! Had one in the UK & now I've come to Australia, I've bought one here. It really is a great bike. Great bike solo --- lacks poke and is under sprung 2 up --- mpg will make ya weep ---makes up 4 it in tyre life -- good touring bike --- will be buying another. I Changed to the Vara from a Africa Twin which I loved, but I wanted a bike to tour on as well as thrash around the lanes and I must say Ii am very impressed. I have just returned from the pyrenies ( 3 of us on Varas ) and all the bikes where supurb and didnt miss a beat. I tried most of the other big trail bikes and the Vara was by far the best. Great, love it to bits. After 5 years on Triumphs, returned to old Honda, no regrets. Two Tigers before and this is far more comfy, esp for longer trips 2 up. However, build quality not quite what you expect from old H with various fittings needing TLC. However, a great all day machine. Absolutely superb bike. Fantastic range, reliable, fast, powerful and easy to ride. Not the best looking bike but certainly striking. Its size, weight and maneouvrability make it a safe bike to ride. Extremely comfortable for touring or just city rides. Can burn up sports bikes if in the mood Can't fault it - well it could do with a sixth gear but heck perfection is paradise and this baby gets as close to it on 2 wheels. Superb bike. I've been to Switzerland, crossed the alps and back. Faultless. I also have a Ducati 916 which when you are in the mood is heaven but for day to day runs & long hauls the Varadero is unbeatable. Would benefit from a sixth gear though.I recently rode a BMW 1100GS - lovely but I prefer the Honda. Fuel economy is a bit harsh. Can surprise sportsbike riders, which I love to do.